I liked playing with dolls when I was a little girl but what I really loved were paper dolls. I still love them and with a whole new world of ‘printables’ out there, beautiful paper dollies are just a click away. I have written about my paper doll habit previously on Babyology and recently found some new ones that are simply too beautiful not to share. The first treasures are by artist Hannah Stevenson who custom makes paper dolls for your little girl (shown at top and above). Beautifully packaged and complete with six outfits, a CD of the doll, a name stand and more, these paper dolls will be at the top of my birthday and Christmas shopping list this year. 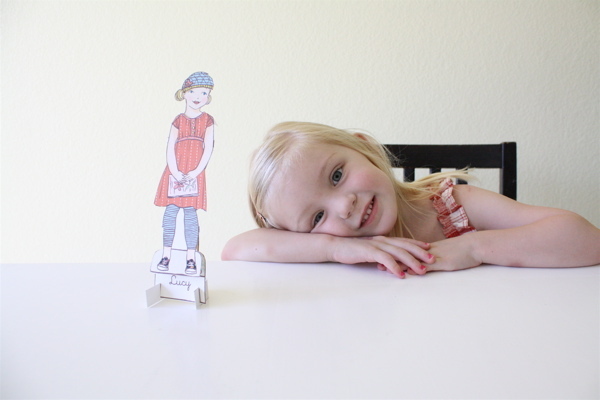 Custom paper dolls begin at just US$10 from Mini Me. Also available are paper doll party kits from US$45, outfit of the month club for US$12 per year and additional sets of clothing including the ‘Girls in Literature’ set featuring outfits for Anne of Green Gables, Heidi and Jo from Little Women. Paper doll heaven! 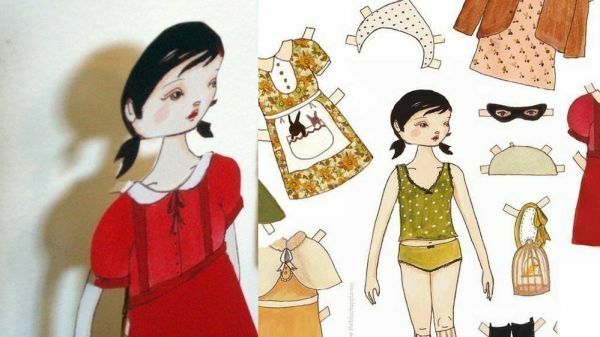 Designer Emilee Rose has a superb collection of paper dolls that have a slightly preppy, slightly vintage look. The outfits that go with Olivia, Sophie, Avery, Carter and more are stunning – belted coats, smocked dresses, pinnies, Mary Janes and knee socks in soft pastel shades are simply gorgeous. Dolls are US$8 each and seven designs are available. Next up we have six sweet friends from the studio of Sarah Jane. 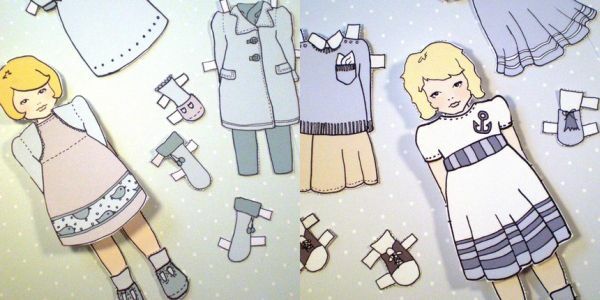 We have featured Sarah Jane’s gorgeous work previously on Babyology so fans are sure to love her paper doll collection. Available as a printable (US$5) or as a pre-printed set (US$9), I like this bunch of friends because there are a couple of boys in the mix. 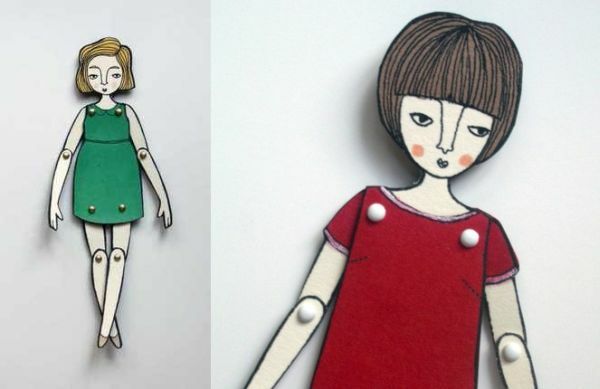 A number of designers have created paper dolls with a modern look. Designer Emily Martin at The Black Apple has a collection with a distinctly urban edge. These dolls can be found wearing fashionable tights, capes, berets and carrying satchels. Martin has produced a number of collectible doll sets over the past few years (mine are all safely behind glass and framed), all displaying her quirky illustration style. A set of three dolls is US$16. Designer Jordan Grace Owens has created a very serious little bunch all featuring ‘moveable’ limbs. Each is hand coloured (and therefore one of a kind) and dolls are US$7 each from Etsy shop Hollandsworth. To keep the dolls company there is also a cat available. 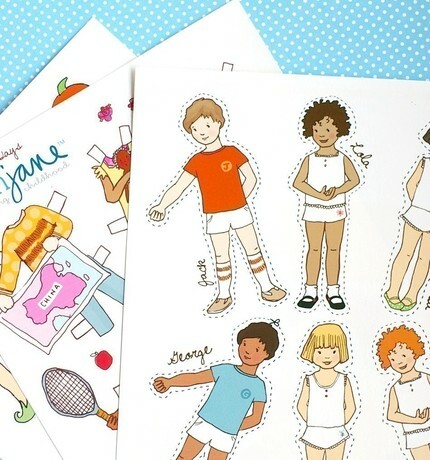 Lastly, artist Sandy Ford creates personalised paper dolls for both adults and children. Her designs are customised for both boys and girls, toddlers and older children and the outfits feature dress-ups and everyday clothes. The sets are also magnetic for simple dressing. Although the toddler sets are adorable, I couldn’t really get past the hilarious adult male seventies collection and I’m thinking that personalised paper men wearing white spangled disco ensembles will make the perfect fortieth birthday gift for hard-to-buy-for guys. Sandy Ford custom dolls range from US$15 to US$28. 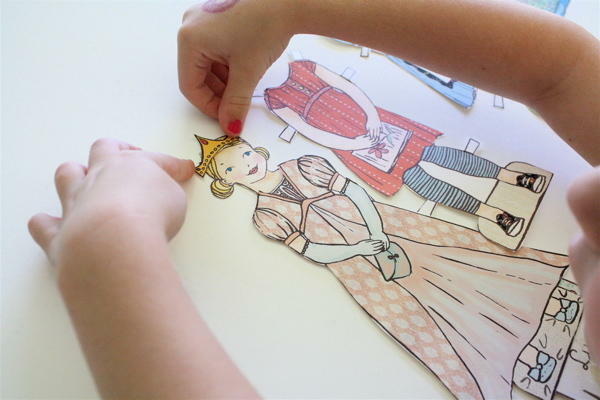 Next rainy day or when the kids are in need of a little craft, keep in mind the paper doll fun that will keep them busy for hours is just a few clicks away.